So I have a new obsession, Starbucks. I have never really been a fan of coffee but I recently tried the "Pumpkin Spice Latte" and LOVED IT! 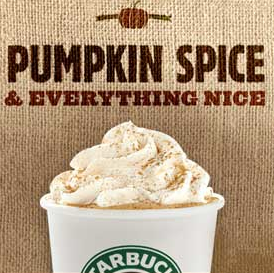 The "Pumpkin Spice Latte" offered at Starbucks contains.. "Espresso, pumpkin-flavored syrup and steamed milk. Topped with sweetened whipped cream and pumpkin pie spices." It's a really fun and delicious drink perfect for the fall time. I really enjoyed it and I'm looking forward to going back soon for another one! I also picked up a couple of their Starbucks mugs, that I thought were really cute. I absolutely adore seasonal drinks around the lovely october, november, december months. They have such yummy spices like pumpkin, gingerbread, and my favorite cinnamon.. OOO Yummy! 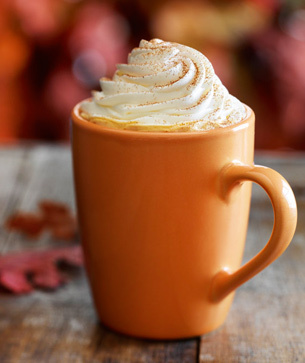 If you haven't tried this "Pumpkin Spice Latte", go to your local Starbucks while it's still fall season, as it's a seasonal item only available during the fall time.